StackStorm is a platform for integration and automation across services and tools. It ties together your existing infrastructure and application environment so you can more easily automate that environment. It has a particular focus on taking actions in response to events. Facilitated Troubleshooting - triggering on system failures captured by Nagios, Sensu, New Relic and other monitoring systems, running a series of diagnostic checks on physical nodes, OpenStack or Amazon instances, and application components, and posting results to a shared communication context, like HipChat or JIRA. Automated remediation - identifying and verifying hardware failure on OpenStack compute node, properly evacuating instances and emailing admins about potential downtime, but if anything goes wrong - freezing the workflow and calling PagerDuty to wake up a human. Continuous deployment - build and test with Jenkins, provision a new AWS cluster, turn on some traffic with the load balancer, and roll-forward or roll-back, based on NewRelic app performance data. StackStorm helps you compose these and other operational patterns as rules and workflows or actions. These rules and workflows - the content within the StackStorm platform - are stored as code which means they support the same approach to collaboration that you use today for code development. They can be shared with the broader open source community, for example via the StackStorm community. StackStorm plugs into the environment via the extensible set of adapters containing sensors and actions. Sensors are Python plugins for either inbound or outbound integration that receives or watches for events respectively. When an event from external systems occurs and is processed by a sensor, a StackStorm trigger will be emitted into the system. Triggers are StackStorm representations of external events. There are generic triggers (e.g. timers, webhooks) and integration triggers (e.g. Sensu alert, JIRA issue updated). A new trigger type can be defined by writing a sensor plugin. Actions are StackStorm outbound integrations. There are generic actions (ssh, REST call), integrations (OpenStack, Docker, Puppet), or custom actions. Actions are either Python plugins, or any scripts, consumed into StackStorm by adding a few lines of metadata. Actions can be invoked directly by user via CLI or API, or used and called as part of rules and workflows. Rules map triggers to actions (or to workflows), applying matching criteria and mapping trigger payload to action inputs. Workflows stitch actions together into “uber-actions”, defining the order, transition conditions, and passing the data. Most automations are more than one-step and thus need more than one action. Workflows, just like “atomic” actions, are available in the Action library, and can be invoked manually or triggered by rules. Packs are the units of content deployment. They simplify the management and sharing of StackStorm pluggable content by grouping integrations (triggers and actions) and automations (rules and workflows). A growing number of packs are available on StackStorm Exchange. Users can create their own packs, share them on Github, or submit to the StackStorm Exchange. Audit trail of action executions, manual or automated, is recorded and stored with full details of triggering context and execution results. It is also captured in audit logs for integrating with external logging and analytical tools: LogStash, Splunk, statsd, syslog. 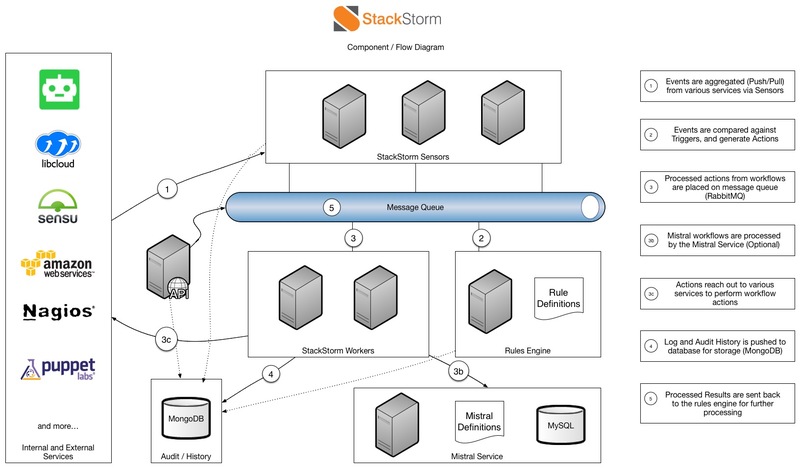 StackStorm is a service with modular architecture. It comprises loosely coupled service components that communicate over the message bus, and scales horizontally to deliver automation at scale. StackStorm has a Web UI, a CLI client, and of course a full REST API. We also ship Python client bindings to make life easier for developers. StackStorm is new and under active development. We are very keen to engage the community, to get feedback and refine our directions. Contributions are always welcome!